In recent decades Seoul has reared its commercial and sporting head from obscurity, becoming an Asian metropolis that no self-respecting world traveller or businessman can ignore. A holiday in Seoul is full of surprises, revealing a city of towering skyscrapers and sleek freeways that preserves a hidden treasure-trove of ancient palaces, temples and beautiful gardens. Although Seoul is one of the most high-tech cities in the world, the traditional culture remains remarkably intact despite the competitive modernity, thanks to decades of relative isolation. Serious sightseers who are intent on delving beneath the glittering surface of the modern city will delight in a holiday in Seoul, where the downtown area boasts plenty of traditional buildings and bustling markets. The city is home to three UNESCO World Heritage Sites, with another looming on the outskirts. Apart from the cultural wealth, travellers will find the residents of Seoul polite and friendly, the nightlife varied and energetic, and the touristic amenities first class. The best seasons to travel to Seoul are spring and autumn, when temperatures are comfortable and skies are blue. Summers (June to August) can be uncomfortably hot and tend to be wet, with the monsoon rains falling between June and September. Winters (December to February) bring bitterly cold conditions, although Seoul is undeniably beautiful blanketed in ice and snow. Read more on Seoul's Climate and Weather. -Explore the grand palaces of Seoul, including Changdeokgung and Gyeongbokgung. -Stroll through the lovely Namsan Park, home to many other attractions. -Visit the UNESCO-listed Jongmyo Shrine. -Experience something of Korean Buddhism at Jogyesa Temple. -Enjoy thrills and spills at Lotte World, the largest indoor theme park in the world. -Trawl the charming antique shops and art galleries of Insadong. -Party the night away in the friendly Itaewon district. -Sample Korean cuisine at the Galbi Restaurants, a fun cultural experience. Many pleasures await travellers just beyond Seoul: Incheon, where most visitors arrive, is a bustling port city with hot springs and great food; the Korean DMZ awaits those who enjoy the thrill of conflict zones and militaristic displays; the UNESCO-listed Hwaseong Fortress is an imposing landmark just south of Seoul; and Everland, South Korea's answer to Disneyland, waits on the outskirts of the city to delight kids. Located 43 miles (69km) west of Seoul, Incheon International Airport is the primary airport for South Korea and is widely acknowledged as one of the best airports in the world, having won many prestigious awards. 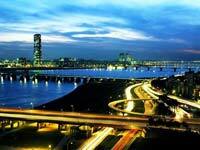 Get more information on Airports in Seoul. -Seoul is the most wired city in the world: incredibly, 95 percent of Korean households have broadband connection, and wifi is almost unavoidable. -The number four is considered extremely unlucky in South Korea; many buildings in Seoul don't have a fourth floor. -Due to the wet climate, fruit is very expensive in Seoul and is considered something of a treat. Seoul is a thriving metropolis encircled by mountains with skyscrapers rising towards the heavens. The city is busting yet organised, with modern marvels growing side by side with centuries-old palaces and shrines. A great deal of the credit for the well-ordered urban planning of Seoul can be given to the ancient Joseon Dynasty, which used great foresight when crafting the city into a capital way back in the 14th century. The old Joseon Dynasty city, with its central main palace, is now the traditional downtown heart of Seoul where many of the most popular sights, hotels, and markets are to be found. One of the most interesting areas for visitors to explore is Insa-dong, filled with antique shops, art galleries, traditional teahouses, restaurants, and bookshops. Across the Han River, the modern city is dominated by Korea's World Trade Centre and the Coex Mall, a shopper's delight. Even the island of Yeouido, in the middle of the Han River, is densely packed with high-rise buildings; this is also the base for the Korean National Assembly and the world's biggest Presbyterian Church. Interspersed through the urban landscape are several lush, green parks, the most central being Namsan Park which encompasses the mountain of the same name just to the south of downtown Seoul. It's also home to the iconic Seoul Tower, which offers spectacular 360 degree views of the city and surrounding countryside. Nightlife in Seoul has something to suit all tastes, from pub hopping to sedate sit-downs at traditional teahouses. Eating out is a feast for the senses in Seoul, with an enormous international variety to choose from, whether it is succulent steak, perfect pizza, multicourse gourmet, tasty tandoori, or, of course, classic Korean.